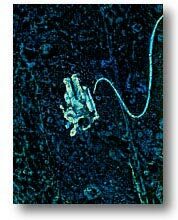 Nick Maley's autobiographical Star Wars related print "Star Voyager 85". An autobiographical painting about Nick's transition from making movies to finding peace in the Caribbean. (Series 1) Reproductions are less pixilated and color may vary. Click here for prices and sizes (SCROLL DOWN TO THE NAME). Ultra limited lithograph and a forerunner to Memories of Degobah,. Of it he says, "I'm very pleased with the way the original concept has been realized, The final painting is very dramatic and the silhouette of Yoda appears as the entrance to a star filled cavern through which the star ship flies in order to reach a small green blue planet. Through the arrangement of stars you can just make out Yoda's face and robe. "Although you don't immediately focus on the planet," Nick points out, "it is a critical element to unraveling the symbolism used. The colors of the planet are the colors of the Caribbean and the painting, although told through a sci-fi allegory, is about me making an over complicated journey... passing through making movies and contributing to the creation of Yoda... to living in the tropics.... making complicated journeys and finding simple solutions. The starship represents the complexity of the vehicle of my life and after a huge technological effort, years of thought and development, the star ship finally finds peace in the galaxy.... a small planet, with an island, a palm tree and a sail boat!" Although the painting deliberately avoids representing a specific scene from Star Wars, it is by the very nature of Nick's association with the movie, inherently linked to the classic trilogy. It is a unique expression of this exceptional movie maker's experience of contributing to the extraordinary phenomenon we call Star Wars before moving on to the Caribbean and triumphs in the art world. 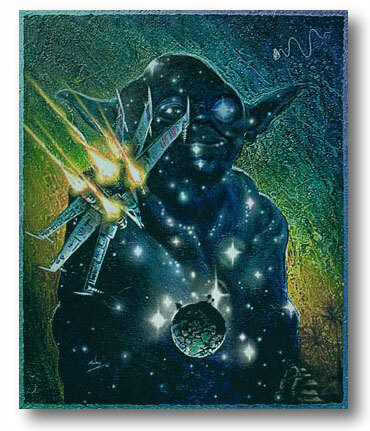 THIS WAS THE ONLY YODA PRINT IN THE WORLD PAINTED BY ONE OF THE TECHNICIANS WHO ACTUALLY CREATED HIM! Those familiar with Nick's aesthetic precepts will recognize his reference to the inverted values of modern life... (a preoccupation with technology and materialism that was fundamental to Nick's rejection of city life in a pursuit of simple living and personal satisfaction)..... most specifically in the form of his famed spaceman icon which you will find quietly drifting in the upper right corner of the painting. The lithograph was first issued as an 16 x 20 limited edition of 195 impressions which is now sold out. There is also an edition of 25 hand embellished giclees on canvas 20x24 and an open edition 8x10 that will perpetuate the image in future years. AntiguaToday! * Home * Community Notices * AntiguaNews * QuickTour * AntiguaLinks * AntiguaToday!